Display function keys by default in Touch Bar. I would like to configure the Touch Bar of my MacBook Pro (13-inch, 2016) to display by default the static fn keys (esc, F1, F2, ...) all the time, since they are the keys I use the most. For now, I only managed to configure the touchbar to be static selecting the 'Expanded Control Strip' option (in System Preferences > Keyboard > Keyboard), so it shows the esc, brightness, mission control, etc. Is there any workaround to do that yet? Running macOS Sierra 10.12.6. System preferences -> keyboard -> Touch Bar shows (under keyboard tab), select from dropdown menu "F1,F2,etc. Keys." This will force the Touch Bar to always and ONLY show the standard function keys f1-f12 with their associated secondary functions by pressing the fn key. Yes, I am on High Sierra, that function must not be in Sierra. In System Preferences → Keyboard → Shortcuts, under Function Keys, add apps to the list to show the function keys by default. The fn key will then be used for the inverse function, hiding the function row instead of showing it. You'll need to do this for every app where you would like this behaviour. 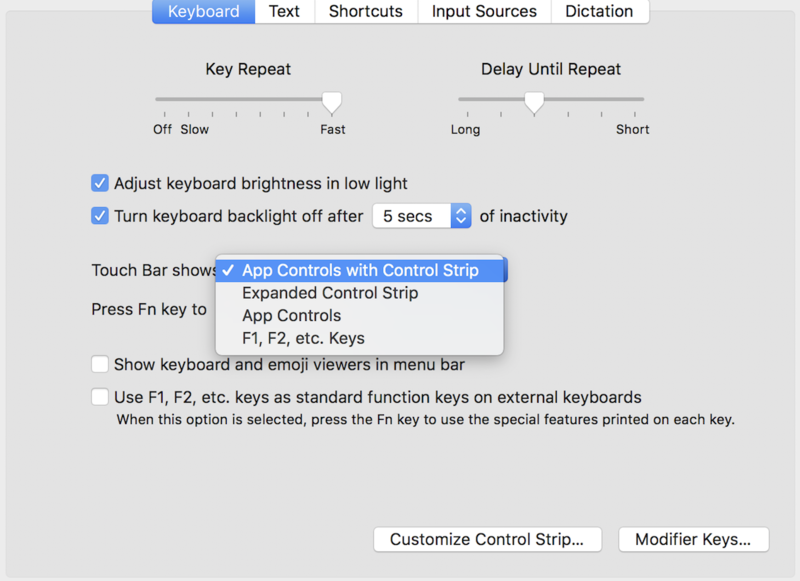 You can display function keys at all times and use Fn to display App Controls or Expand Control Strip in System Preferences → Keyboard → Keyboard.